Thank you for connecting with SyncShow. Manufacturing is what we know, its in our blood. We will contact you shortly to schedule a follow up conversation and answer any questions you may have. 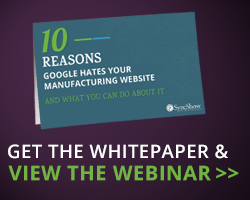 Learn how we have helped manufacturing companies grow through inbound marketing and lead generation. Copyright 2017 Syncshow all rights reserved.